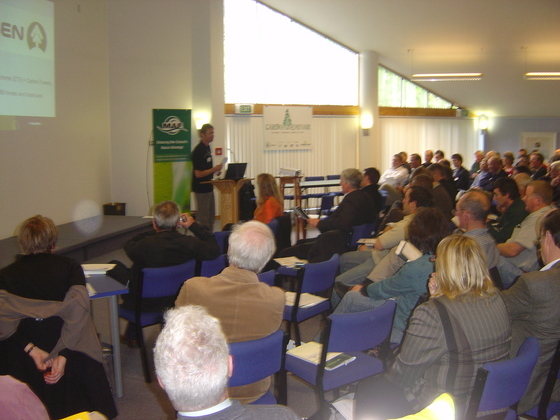 The Hawke's Bay Farm Forestry Association's (HBFFA) "Carbon - Ready or Not" seminar was held in Havelock North Thursday 18 September 2008. This was a well attended event with Bob Pocknall, PF Olsen's Hawke's Bay manager and other local HBFFA organisers putting together an excellent line up of knowledgeable speakers. An audience of over 200 heard from a range of speakers including Julia Hoare from Price Waterhouse Coopers, Bruce Manly from the University of Canterbury, Peter Weblin from PF Olsen and MAF representatives. These types of forums are good opportunities for people to not only update themselves on current thinking, but also to meet and talk with others interested and involved in forestry and carbon/climate change issues. One of Julia's messages came across load and clear: Even if you are sceptical of climate change and doubt the science, from a business perspective, you cannot ignore it. She emphasised how it is important to get your business "carbon-ready". Bruce Manly presented the findings of a study undertaken by the University which looked at different species and forestry regimes and concluded that well-managed carbon forestry presented a viable opportunity to achieve superior rates of return. Peter Weblin (see photo above) presented a more practical perspective and explored the decision-making and planning required for successful carbon forestry projects. "Whilst there are exciting new opportunities for growing trees in a carbon-constrained world, each individual's situation is different and there's not one solution for all", pointed out Weblin. "For example, whether you currently own trees, their species and age-class, whether you can plant more trees and whether you also have emitting businesses (such as farming) are some of the critical variables that influence project design." Now that the Emissions Trading legislation has been passed, this seminar constitutes one of those important steps in developing knowledge and understanding of this complex issue. PF Olsen has more Carbon Seminars scheduled.